Much of the mainstream news coverage from the recent G20 summit in Hangzhou, China, read like the script of a particularly bad farce about the minutiae of diplomacy. How we all laughed when a red carpet went missing at the airport. Didn’t we gasp when the leader of a nation of 100 million people appeared to call someone ‘a son of a whore’? All it needed was a bathtub going down a hill to be Last of the summer macroeconomics. More sober analysis has written off the summit – which gathered the leaders of 20 major economies, along with central bankers, finance ministers and the like – as a damp squib that failed to take any meaningful action on a weak global economy facing poor growth forecasts. The result was the G20 blueprint on innovative growth. Part aspiration, part best-practice guide, it is an explicit recognition of the strong links between research, innovation, development and growth. For those worried that politicians simply don’t understand that relationship, the blueprint might offer some reassurance. ‘We recognize that in the long run, innovation is a key driver of growth for both individual countries and the global economy as a whole,’ states the accompanying G20 leaders’ communiqué. Not that the blueprint is a riveting read. Some of its paragraphs descend into eye-glazing banality (‘We aspire to synergy in the discussion across work streams within the G20…’). But it is backed by a series of action plans offering more detail, and its central message has a symbolic power that could influence national innovation policies. This might all seem like a long way from the lab. It is. But for innovators around the world, from bench to boardroom, it could offer useful leverage to argue for policies that stimulate research and development. 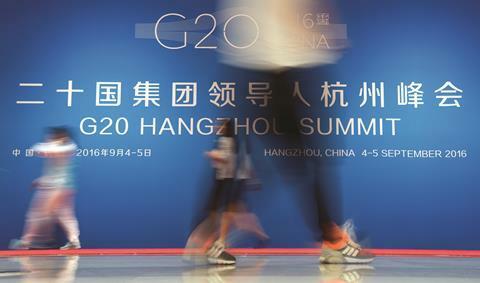 It is no coincidence that this emphasis on innovation comes as China chairs the G20. Over the past decade, the country has poured investment into science and technology, rolled out a string of policies to forge better links between academia and industry and nurtured international partnerships to stimulate domestic innovation. Seen in this context, the G20’s innovation blueprint looks like an extension of China’s own policy. But will it work? The G20 is basically a club that can tackle economic problems at a global level by sharing information or taking collective action. It is not immediately obvious that a lack of such coordination is the main barrier to innovation. And as both a product and a tool of globalisation, the G20 represents the sort of top-down governance that people increasingly rail against, sceptical that it can tackle growing inequality. Yet we expect this kind of global coordination in climate change and public health. For example, at the COP21 climate change summit in Paris last year, most G20 nations committed to double their funding of clean energy research over the next five years. And with G20 members accounting for more than 80% of the world’s total R&D investment, it is well placed to change the economic landscape in which innovation occurs. In the blueprint, the G20 leaders commit to improving skills training for science, technology and innovation, and explicitly say they will support more women entering these fields. Digital technologies like artificial intelligence and cloud computing are placed front and centre as key innovation targets. So are new materials, nanotechnology and biotechnology. The G20 says that it needs to make it easier for researchers and innovators to move between countries, because mobility is essential to innovation-based economies. It’s a point that the UK would do well to bear in mind when it eventually enters Brexit negotiations with the EU. The blueprint emphasises the need for sustainable development and collaboration with the developing world, supported by a shared set of guiding principles for international investment, along with the digital infrastructure needed to help the flow of money and ideas. G20 leaders also agreed that the results of publicly funded research should be published on findable, accessible, interoperable and reusable (FAIR) principles. That means adopting standards that not only allow more people to access more data; they would also enable computers to search and analyse huge datasets across entire fields of study. The blueprint is not a binding treaty, but there will be a framework to track whether nations are meeting their commitments, along with clear targets that will act as a roadmap to chart their progress. Global economic growth has helped to lift billions of people out of extreme poverty, and innovation is one of the best ways to ensure that the trend continues. The G20 leaders have firmly endorsed that idea – from now on, researchers should remind them of their commitments at every opportunity. Thanks to Feride Inan, policy analyst at the Economic Policy Research Foundation of Turkey and a visiting research fellow at Renmin University of China, for a helpful discussion.